Describing Scrum and me and my groups experience with is all well and good, but I also want to go over some of the things I have been producing these last two weeks. Right now we are coming up on the Beta deadline for our project, and, due to some of the reasons stated in my previous blog post, we are a little bit behind in terms of art assets. Which meant that it has been the time for me to increase my production pace a bit. Last week I worked on the death animation for our shark enemy. The process of how I made it is very similar to how I created the swimming animation for it. I started out by figuring out the movement, added the rest of the body, drew the outline, and lastly added some color to it. If you want a more detailed description of how I created it check out my blog post from two weeks ago. That took up most of last week and didn’t leave me with much time to work on other assets. The good news is that this week that is exactly what I have been able to focus on this week. We started out this week by discussing what art we needed in the beta during our monday meeting. A few of those things had to be kept as a placeholder for now, and I don’t feel like they are that valuable to share. Therefore I will instead show you one of the things that I actually put some effort into. In the original concept of our game you are meant to set sail and find Umibozu, and then escape from it when you manage to find it. One of the main topics during our monday meeting was whether or not we should include the escaping part. In the end we decided that including that segment would take too much time and effort compared to what it added to the gameplay experience. We now needed a way to signal to player that they had reached the end and that that they’ve found Umibozu. 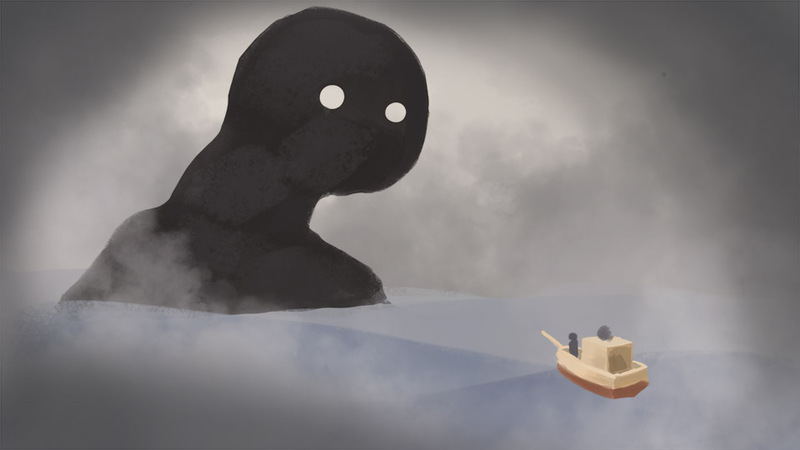 In order to show this we decided that we wanted an illustration of the player character in front of Umibozu. re and lighting after the general composition was finalized. Because I needed to complete it quickly I also relied heavily on custom brushes in order to create textures and effects. I would love to revisit this before the project is finished and give it the touch up I think it deserves, but due to needing to complete other assets, this is how it will look in the beta. That’s it for now, Esbjörn out!